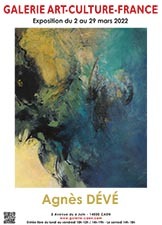 Agnès Hémery appears determined to convey her artistic message and vision without hiding behind a comfortable reality. This is what can be felt when we discover her works, which have been exhibited in numerous and prestigious exhibitions in France and abroad with success. In fact, without establishing a doctrine on the subject, this artist is able to express her states of feeling in an abstract manner, while letting her mind reveal itself in her compositions. Supple and elegant swirls are reinforced at the touch of her paintbrush which, imbued with solid matter, is able to release indefinably appealing colours and light. 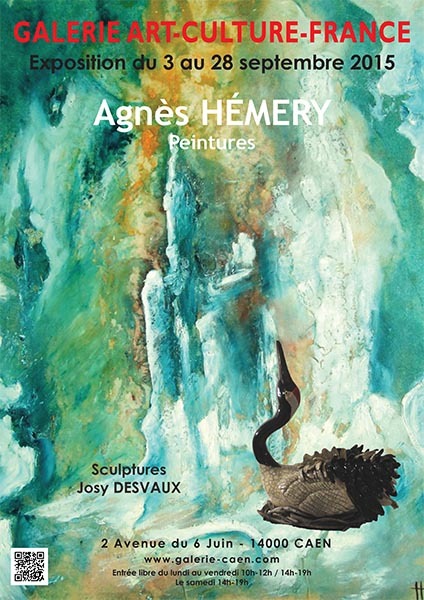 Yet Agnès Hémery is not unaware that the universe's symbolism can showcase an emotion of a more tangible evocation. She introduces an emphasis in her dream-like world through certain motifs, mythical beings and animals. Their fine elegance is amplified by their spectacular definition, a quality that can also be seen in her compositions evoking the mysterious. These portray fascinating bursts of colour, and daring harmonies, greatly enhancing the precise and well thought-out postures, which the artist conveys with as much talent on canvas as on a paper support.